It was a busy day Feb 12 as two of Canada’s leading professional golf organizations made significant announcements. The PGA TOUR Canada finally released full details of their Qualifying School and opened up registrations for the event. Qualifying for the PGA TOUR Canada will take place in California on April 7-12. The Morongo Golf Club at Tukwet Canyon in Beaumont will serve as host. Beaumont served as host for the tour’s Q-School in 2012 when it was known as the Canadian Tour. A total of forty players will gain access to the tour at the school. The top twenty players will become fully exempt while the next twenty will have conditional status. “PGA TOUR Canada Q-School has a history of producing some great players at this level and beyond,” said PGA TOUR Canada President Jeff Monday. PGA TOUR Canada alumni to come from Q-Schools conducted in California include Brendan Steele, Spencer Levin, Andres Gonzales and Adam Hadwin. “We’re looking forward to seeing the crop of players to come from this Q-School and the impact they’ll make on PGA TOUR Canada,” added Monday. Registration for the Q-School will be open until March 20th. Fonthill, Ontario will host the Mr. Lube PGA Seniors’ Championship of Canada later this summer. The near century old Lookout Point Country Club will play host. 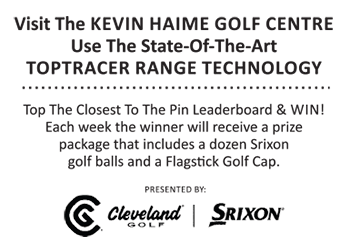 The Walter J. Travis design is renowned for it’s rolling topography and tiny putting sufaces, making it a great challenge for some of Canada’s finest senior-aged golf professionals. The Mr. Lube PGA Seniors’ Championship of Canada takes place Aug. 6-9 and is contested over 54 holes. The Super Seniors’ (60 and older) division is contested over 36 holes in two days.